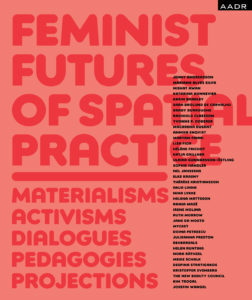 Welcome to the book launch of ‘Feminist Futures of Spatial Practice’! Book editor Meike Schalk and authors Elke Krasny, Helena Mattsson and Sara Brolund de Carvalho will share insights from the book with a lively Q&A. ABOUT THE BOOK: Architecture and the arts have long been on the forefront of socio-spatial struggles, in which equality, access, representation and expression are at stake in our cities, communities and everyday lives. Feminist spatial practices contribute substantially to new forms of activism, expanding dialogues, engaging materialisms, transforming pedagogies, and projecting alternatives. 40 contributing authors include international practitioners, researchers, and educators, from architecture, the arts, art history, curating, cultural heritage studies, environmental sciences, futures studies, film, visual communication, design and design theory, queer, intersectional and gender studies, political sciences, sociology, and urban planning. Die Veranstaltung wird mehrsprachig sein, hauptsächlich Deutsch/Englisch.